New Delhi, India -- Twenty-nine-year-old Gagan Kaur's life fell apart when her 14-year-old relationship ended last year. A Buddhist monk found her sinking in a private clinic in the capital after an abortive suicide bid. A year later, Gagan is in control of her life after rigorous vipassana, a Buddhist mindful meditation. She is part of a Japanese Buddhist community which chants every weekend at a retreat in south Delhi. "Most of the congregation members are young professionals," Gagan said. 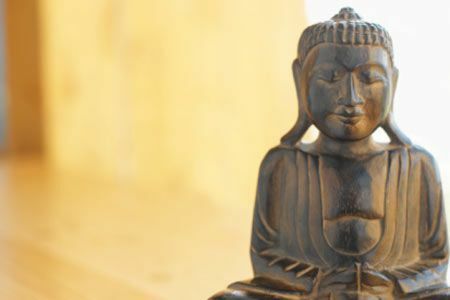 In the 21st century, Buddhism, a religion and a philosophy that was born in India and then spread to the east and has millions of followers worldwide, is expanding in scope to move beyond the realm of an eight-fold regimen to the attainment of nirvana. It is being increasingly used as a cure by therapists in India and around the world to address lifestyle-related psychological problems like alienation, anxiety and stress. Priyanka Khera (name withheld), a 24-year-old student of business management, battles the stress of a tangled love relationship and her alienation from her homeland Jammu and Kashmir with Buddhist chants and meditation. "This year I broke up with my boyfriend with whom I stayed for a year in Chandigarh. Moreover, I had a troubled childhood since my parents moved from Srinagar when I was barely one. I am tormented by nightmares - and have drifted away from my parents over the years. At times, I want to go back to Srinagar. I hate this city...," Priyanka, who lives with "friends" in east Delhi, said. Her psychiatrist is a Buddhist counsellor in her neighbourhood who is teaching her the "importance of equanimity" to calm her stormy inner self. Buddhism in the last decade has become a viable lifestyle and spiritual option for tens of thousands of youngsters in cities to cope with stress in schools, colleges, workplaces and among peers. It is also being used as intervention to rehabilitate criminals. Researches conducted by the University of Washington in Indian prisons show that "vipassana" can effectively reduce psycho-pathological symptoms and aggression among inmates. "Buddhism becomes a healing science when you drop all the religious terms and replace them with psychological terms - like 'mistake' for 'sin' and unwholesome for 'evil'. We don't need so much of religion as loving kindness to each other ... there is no need to elevate it to another god," doctor Maurits G.T. Kwee, a clinical psychologist and honorary professor of University of Flores in Argentina, said. Kwee, the editor of a new anthology, "New Horizons in Buddhist Psychology (Tao Institute)", said, he had helped himself with grief therapy when his wife passed away 14 weeks ago of lung cancer. "I try grief therapy with my clients too," said the doctor, who is in India for a World Buddhist Congregation Nov 27-30. More than 900 Buddhist scholars, leaders and practitioners from 46 countries are deliberating on the relevance of Gautama Buddha's teachings at the meet. There is a principle in Mahayana Buddhism - "Upaya-kausalya" - a concept which means application of skillful means, the doctor explained.